The White House says it has no information to contradict the French government's assessment that the Islamic State carried out the Paris attacks. President Barack Obama reviewed the latest intelligence with his national security team on Saturday before departing for a global economic summit in Turkey. The White House said afterward that Obama was briefed on cooperation with the French on intelligence sharing and military action against the Islamic State group. Obama earlier called the attacks on Paris "outrageous attempt to terrorize innocent civilians" and vowed to do whatever it takes to help bring the perpetrators to justice. Speaking to reporters at the White House, Obama called the attacks a "heartbreaking situation" and an "attack on all of humanity." Saudi King Salman phoned French President Francois Hollande to offer his condolences. The official Saudi Press Agency says the two men agreed to enhance "coordination and cooperation to combat the scourge of terrorism in all its forms and manifestations which target security and stability all over the world." Bosnia's government says terrorists attacked "our civilization" and raised security measures in the country, particularly around foreign embassies. The leader of Bosnia's Muslims, Husein Kavazovic, says the attacks were "a heavy moral downfall." "We remember the support and solidarity of the French people with us when we recently were experiencing fear and terror," Kavazovic said in a statement, referring to the 1992-95 Bosnian war. He added that he hopes France will "adequately respond to terrorism but also vehemently resist to the terrorists' intention to incite anger and revenge toward Muslims and Muslim communities in Europe." He addressed Muslims in Europe, saying "terrorists do not represent our faith or our community and terrorism cannot be justified morally, religiously or politically." Polish President Andrzej Duda condemned the "barbaric attacks" that hit the "very heart of European civilization" and promised assistance. "Vive la France!" he wrote. Acting Prime Minister Ewa Kopacz signed a condolence book at the French Embassy in Warsaw, where residents brought flowers. Kopacz said that speeding up the joint struggle against terrorism should be Europe's priority and noted that sometimes the world is "helpless" in the face of terrorism. Incoming Prime Minister Beata Szydlo, who will be sworn in Monday, signed in the condolence book at the French Consulate in Krakow, and laid a wreath of white, red and blue flowers. "We feel solidarity with the people of France. 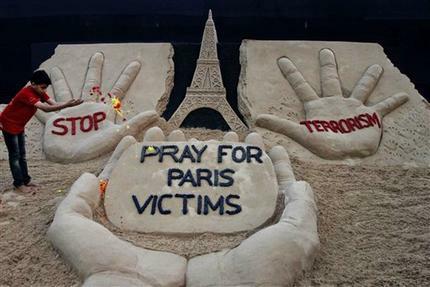 We are praying for Paris, we are praying for the victims," she said. Landmark buildings in Poland were illuminated with red, white and blue lights. Pakistan's Information Minister Pervez Rashid says the deadly terrorist attacks in Paris are "an attack on mankind" and Pakistan condemns terrorism in all its forms and manifestations. In a statement, he said Pakistan "can feel the pain and anguish of the people of France" as his country has been a victim of terrorism. Rashid said Pakistan is already cooperating with the international community to eliminate terrorism and make the world a safer place. The country's foreign ministry has also "strongly" condemned the attacks and expressed condolences. Angel Gurria, secretary-general of the Organization for Economic Cooperation and Development, condemned the "barbaric" attacks in Paris and offered condolences to the people of France. Speaking in Turkey before a G-20 summit, Gurria said: "The OECD condemns in the strongest terms the barbaric terrorist attacks perpetrated in Paris last night." German Chancellor Angela Merkel pledged to work closely with the French government to help hunt for the culprits involved in the attacks and their backers. "This attack on freedom was aimed not just at Paris, it targeted and it hits all of us. That is why we must all respond together," said Merkel, dressed in black, her voice faltering. "We, your German friends, feel very close to you. We cry with you," she said. "We will lead this fight together with you against those who did such unimaginable things to you." She said she would be meeting with the relevant ministers to discuss ongoing developments in France and address questions. Gauck said while Germany mourns with France, the anger at the murderers must become resolve to defend Europe. "Europe's values and Europe's freedom have been attacked by powerful enemies throughout history. Nevertheless, our Europe is a fortress of democracy and human rights. Even the brutal attacks of Islamist terrorists won't change this," Gauck said. Queen Elizabeth II has sent French President Francois Hollande "sincere condolences" to the people of France amid the terror attack in the French capital. The monarch and the Duke of Edinburgh said they were "deeply shocked and saddened" in a statement released by Buckingham Palace. The statement says the queen and Prince Philip "send our most sincere condolences to you, the families of those who have died and the French people." Tunisian President Beji Caid Essebsi condemned the "barbarous acts" in Paris as he arrived at the Elysee Palace for a previously scheduled meeting with French President Francois Hollande. Essebsi called on "all freedom-loving peoples to coordinate their efforts against evil" and said "every country must feel concerned." Offering his condolences to the relatives and all French people, Slovak President Andrej Kiska said he was shocked and also angry by the attacks. "The terrorists again murdered people in Paris to spread fear and hatred among us in Europe. To spread evil and chaos. After such a hard night, Europe needs even more unity and needs to take a real action. Terrorism never destroys democracy and freedom in Europe if we are able to defend our values: altogether and resolutely." Indian Prime Minister Narendra Modi, on a visit to the United Kingdom, said he condemned "the barbaric terrorist attacks in Paris in the strongest terms." "More than a hundred people lost their lives while they were doing what they loved, or spending time with their loved ones," Modi said in a statement. "We feel the shock, pain and outrage of the people of France. India stands firmly with the great people of France in dealing with this tragedy. And we must stand together as humanity in combating the major global threat of our times and to uphold our values and our way of life." Nordic governments have condemned the Paris attacks, while ordinary citizens laid flowers and lit candles outside French embassies across the region. Swedish Foreign Minister Margot Wallstrom talked about the "horrible news," while her Danish counterpart, Kristian Jensen, said "terrorists must be defeated. They cannot break democracies that stand together." Finnish Prime Minister Juha Sipila said that "we must not give space for fear and intolerance." After laying flowers outside the French Embassy on Saturday, Danish Prime Minister Lars Loekke Rasmussen said that "the perpetrators must be pursued and defeated. We will never give up." Swedish King Carl XVI Gustaf said he was "shocked," adding that "it is important that we stand together against this unimaginable terrorism." Denmark's government ordered flags on official buildings lowered to half-staff Saturday as a sign of solidarity. Japanese Prime Minister Shinzo Abe, who is in Turkey ahead of a G-20 meeting, observed a moment of silence together with his Turkish counterpart, Ahmet Davutoglu, in honor of those killed in the Paris attacks. The two leaders expressed solidarity with the French people at the start of a Turkish-Japanese business forum in Istanbul. Abe said: "We will stand against terrorism regardless of its reasons. We will stand in solidarity with the international community to prevent acts of terrorism." Davutoglu said his country stood "shoulder-to-shoulder" with both France and Lebanon, which suffered a terrorist attack on Thursday. Chinese President Xi Jinping issued a statement addressed to French President Francois Hollande expressing solidarity with the French people and condolences for the victims of Friday's attack. "At the sorrowful moment of the French people, I, on behalf of the Chinese government and the Chinese people, and personally, condemn in the strongest terms the barbaric acts," Xi said. Australian Prime Minister Malcolm Turnbull extended Australia's deep sympathy to the people of France. "Our thoughts and prayers are with them at this terrible time," Turnbull said in a statement from Berlin. "But our solidarity is with them too. When the French people left the stadium after that shocking attack, they were not cowed. They sang their national anthem proudly and that is how all free people should respond to these assaults." "In France, and Australia, all around the world, we stand shoulder to shoulder with the people of France and with all free peoples in the battle against terrorism," Turnbull added. The Australian government said a 19-year-old Australian woman had been injured in the attacks. Pope Francis said he was "moved and saddened" by the attacks in Paris but confessed that "I don't understand these things. They are difficult to understand, carried out by human beings." The pope, speaking in a heavy and measured voice, made the comments in a phone call broadcast on the Italian Bishop's Conference TG2000 on Saturday. Asked if there can be a religious justification for such attacks, Francis responded: "Religious and human. This is not human." Francis says he was "close to the much-beloved people of France, I am close to the relatives of the victims and I pray for all of them." Afghan President Ashraf Ghani said in a tweet to French President Francois Hollande: "I sympathize with you and your people; Afghanistan stands with France with resolve to tackle terrorism as a common enemy." A statement from Ghani's office quoted him as saying: "The brutal attacks in Paris prove that global terrorism does not recognize borders." "Afghan people have for many years been the victims of terrorist attacks. They feel the pain of Parisians, and share the grief of the victims' families," Ghani said. "The people of Afghanistan stand with France on this terrible day. Terrorism is a serious threat to the entire world and we are united in the struggle." Prime Minister Benjamin Netanyahu says in a statement, "Israel stands shoulder to shoulder with French President Francois Hollande and with the people of France in our common battle against terrorism." Secretary of State John Kerry is describing the attacks in Paris as "heinous, evil" and "vile," calling them "an assault on our common humanity." Kerry says the U.S. embassy in Paris is "making every effort to account for the welfare of American citizens in the city." He says the U.S. stands ready "to provide whatever support the French government may require." U.N. Secretary-General Ban Ki-moon is condemning "the despicable terrorist attacks" in Paris. U.N. spokesman Stephane Dujarric says Ban "trusts that the French authorities will do all in their power to bring the perpetrators to justice quickly." The U.N. Security Council also condemned "the barbaric and cowardly terrorist attacks," and underlined the need to bring the perpetrators of "these terrorist acts to justice." King Abdullah II "expressed strong condemnation and indignation at the cowardly terrorist act," and solidarity with the French people, in a statement published by state news agency Petra. Iranian President Hassan Rouhani has sent a message to French President Francois Hollande condemning the terror attacks in Paris that killed over 120 people. The state-run IRNA news agency quoted Rouhani as saying Saturday that Iran "itself has been a victim of the scourge of terrorism" and the fight against terrorism must go on. Rouhani also canceled visits to France and Italy, due in a few days. France was one of the world powers involved in recent negotiations with the Islamic Republic over its contested nuclear program. Hossein Jaber Ansari, a Foreign Ministry spokesman, also was quoted by IRNA as saying: "Those terrorist groups that committed the Paris crimes do not believe in ethical principles and they are not loyal to any type of divine religions - including Islam." Prime Minister David Cameron says he is "shocked" by the Paris attacks and violence. Cameron said on Twitter: "Our thoughts and prayers are with the French people. We will do whatever we can to help." Egyptian President Abdel-Fattah el-Sissi has condemned the Paris attacks and is conveying condolences to the victims. A statement from his office on Saturday called for "concerted international efforts" to combat "the scourge of terrorism, which aims to destabilize security and stability in various parts of the world, without distinction." In the United Arab Emirates, the state-run WAM news agency says President Sheikh Khalifa bin Zayed Al Nahyan sent a telegram to French President Francois Hollande offering his condolences and pledging support for France. WAM says Al Nahyan also supported doing "what it takes to face terrorism and eliminate it." The ruler of tiny Kuwait, emir Sheikh Sabah Al Ahmad Al Sabah, says in a statement that he offered his condolences, while stressing that "these criminal acts of terrorism ... run counter to all teachings of holy faith and humanitarian values." In Saudi Arabia, the state-run Saudi Press Agency quoted a Foreign Ministry official denouncing Friday's attack. Foreign Ministry spokesman Hong Lei says China is "deeply shocked" by the attacks and pledged solidarity with France in combating terrorism. "Terrorism is a common challenge facing humanity. China resolutely supports France in maintaining its national security and stability and in attacking terrorism," Hong said. Japan's Foreign Minister Fumio Kishida says he is "deeply shocked and outraged" by the news of the terrorist attacks in Paris. Kishida, speaking to reporters Saturday in Hiroshima, said Japan stands by France, promising to cooperate in international fight against terrorism. "We strongly condemn the act of terrorism, which we do not tolerate for any reason," he said, expressing condolences to the victims and their families. Defense Secretary Ash Carter is calling the attacks in Paris "an assault on our common human dignity." The Pentagon chief says "the United States stands with the people of France and its vibrant, multicultural democracy." He is praising France as a NATO ally and a leader of the coalition fighting Islamic State militants in Syria. Prime Minister Justin Trudeau said, "Our hearts and thoughts and prayers go out to our French cousins in this dark and terrible time." He said Canada has offered "all of our help and support to the government of France." A cinco años de mi Viaje a la realidad.